"A Slice of the Good Life"
Location of Hope in Hempstead County, Arkansas. Hope is a city in Hempstead County in southwestern Arkansas, United States. Hope is the county seat of Hempstead County and the principal city of the Hope Micropolitan Statistical Area, which includes all of Hempstead and Nevada counties. As of the 2010 census the population was 10,095, and in 2015 the population was estimated at 9,891. Hope is the birthplace of two long-serving Arkansas governors: Bill Clinton (who went on to become the 42nd President of the United States after the 1992 election) and Mike Huckabee (who ran for the Republican presidential nomination in 2008 and 2016). It is also the birthplace of White House Press Secretary Sarah Huckabee Sanders. Hope began in 1873, when a railroad was built through the area. The town was named for Hope Loughborough, the daughter of a railroad executive. According to the United States Census Bureau, the city has a total area of 10.2 square miles (26.3 km2), of which 10.1 square miles (26.1 km2) are land and 0.1 square miles (0.2 km2), or 0.74%, are water. The climate is characterized by hot, humid summers and generally mild to cool winters. According to the Köppen Climate Classification system, Hope has a humid subtropical climate, abbreviated Cfa on climate maps. As of the 2010 United States Census, there were 10,095 people residing in the city. The racial makeup of the city was 43.2% Black, 34.0% White, 0.2% Native American, 0.2% Asian, 0.1% Pacific Islander, 0.1% from some other race and 1.4% from two or more races. 20.8% were Hispanic or Latino of any race. As of the census of 2000, there were 10,616 people, 3,961 households, and 2,638 families residing in the city. The population density was 1,061.9 people per square mile (409.9/km²). There were 4,301 housing units at an average density of 430.2 per square mile (166.1/km²). The racial makeup of the city was 47.71% White, 43.17% Black or African American, 0.38% Native American, 0.30% Asian, 0.03% Pacific Islander, 6.63% from other races, and 1.78% from two or more races. 13.48% of the population were Hispanic or Latino of any race. There were 3,961 households out of which 34.3% had children under the age of 18 living with them, 40.8% were married couples living together, 21.0% had a female householder with no husband present, and 33.4% were non-families. Of 3,961 households, 192 are unmarried partner households: 175 heterosexual. 29.3% of all households were made up of individuals and 13.8% had someone living alone who was 65 years of age or older. The average household size was 2.61 and the average family size was 3.20. In the city, the population was spread out with 28.9% under the age of 18, 10.8% from 18 to 24, 27.3% from 25 to 44, 18.4% from 45 to 64, and 14.6% who were 65 years of age or older. The median age was 32 years. For every 100 females, there were 87.3 males. For every 100 females age 18 and over, there were 81.7 males. The median income for a household in the city was $25,385, and the median income for a family was $28,445. Males had a median income of $23,525 versus $17,394 for females. The per capita income for the city was $12,783. About 22.3% of families and 27.2% of the population were below the poverty line, including 41.1% of those under age 18 and 17.3% of those age 65 or over. Hope is also known for growing watermelons and continues to produce records for the largest specimens in the world. The last record was set by Lloyd Bright in 2005 with a 268.8 pound watermelon. The Watermelon Festival is celebrated annually from Thursday-Saturday during the second week of August. The watermelon is used in the municipal logo and the Hope slogan: A Slice of the Good Life. Public education at the elementary and secondary school level is provided by the Hope School District, Blevins School District and Spring Hill School District. Hope School District includes William Jefferson Clinton Primary School for Kindergarten through Fourth Grade, Beryl Henry Elementary School for fifth and sixth grade, Henry C. Yerger Middle School for seventh and eight grade, and Hope High School for ninth through 12th grades. Hope also has a private school, Garrett Memorial. Post-secondary educational opportunity is provided by the University of Arkansas at Hope. Hope has three forms of local media. SWARK.Today and HopePrescott serves as the city’s two Social Media News websites HopePrescott also produces the city's newspaper. In addition, there are at least three local radio stations in and around Hope. The city is served by local television stations from the Little Rock Arkansas,Shrevport Louisiana and Texarkana Texas Ark-La-Tex markets. There are currently no local TV station(s) for Hope. Hope Municipal Airport is located on property that was once part of the Southwestern Proving Ground, one of six major military facilities in Arkansas during World War II. At the time of its construction, the airport held claim of having the third longest runway in the United States. From 1942 to 1945 the airport and surrounding 50,078-acre Southwestern Proving Ground were used by the U.S. Army to test small arms ammunition, 20 to 155 mm projectiles, mortars, rockets, grenades, and up to 500-pound bombs. The City of Hope received the airport facility in 1947. Paul Klipsch, a United States Army Veteran who served at the site, was among those who started businesses in the re-purposed buildings. He established Klipsch speaker company there and was known to joke that his desk was not in the same spot as the one he had during his service. "It was" he said, "on the other side of the room." In the aftermath of Hurricane Katrina in 2005, FEMA used land near the airport as a staging area for manufactured homes intended as temporary housing for the hurricane victims; however, as of 2009, infrastructure and property damage remained so severe in the hurricane's path that many homes remained at the airport, eliciting criticism of the federal agency. In October 2009, Amtrak added Hope to its timetable brochure for its Texas Eagle service. On March 24, 2013, it was announced that service would begin on April 4. The Texas Eagle travels daily in each direction between Chicago and San Antonio. Hope is the hometown of former U.S. President Bill Clinton, whose childhood home is located in the town. At the 1992 Democratic National Convention in New York City, then-Governor Clinton ended his acceptance speech by saying, "I still believe in a place called Hope." The city adopted this statement as its unofficial motto. The city converted its railroad depot to a museum about Clinton's life. Hope is also the hometown of the former Governor Mike Huckabee. In his autobiographical From Hope to Higher Ground (2007), Huckabee recalls the Hope of the 1960s as "a wonderful community. A child could leave his house in the morning on a bicycle and not return until after dark, and it caused no one alarm. It was the kind of place where I could misbehave eight blocks from home, but by the time I pedaled back to 309 East Second Street, six people would have called my parents to report my behavior. I am not sure that it took a village to raise a child, but I am quite sure that an entire village did its part to help raise me!" Others from Hope include former White House Chief of Staff Mack McLarty; Sarah Huckabee Sanders; attorney Vince Foster; former Louisville, Kentucky, Mayor David L. Armstrong; Gary Dee; former Arkansas Secretary of State Kelly Bryant, PGA golfer Ken Duke, actress/vocalist Ketty Lester, and actress Melinda Dillon. Country Music Hall of Fame singer Patsy Montana attended school in Hope. A member of Congress, Joseph Barton Elam of Louisiana's 4th congressional district, was born in Hope. He served from 1877 to 1881 and resided in Mansfield, Louisiana. Harry Jacob Lemley, a U.S. District Court judge appointed by Franklin D. Roosevelt, had formerly practiced law in Hope. Paul Klipsch founded Klipsch and Associates in Hope in 1946. Klipsch invented the world-famous Klipschorn speaker, a folded horn loaded speaker that revolutionized the industry. The Klipschorn and a number of other speaker lines are still manufactured in Hope by Klipsch Audio Technologies. Former U.S. Representative Mike Ross of Arkansas's 4th congressional district, currently resides in Prescott in Nevada County but is a former resident of Hope. He graduated in 1979 from Hope High School, and his father, Gene Ross, is a former administrator in the Hope School District. Ross was the unsuccessful 2014 Democratic gubernatorial nominee against Republican Asa Hutchinson. The city is also the birthplace of Shirley Weber, who represents the 79th district in the California State Assembly. ^ a b "Geographic Identifiers: 2010 Demographic Profile Data (G001): Hope city, Arkansas". American Factfinder. U.S. Census Bureau. Retrieved April 19, 2017. ^ "Hope (Hempstead County)". Encyclopedia of Arkansas. The Central Arkansas Library System. Retrieved 25 June 2014. ^ Harris-Smith, Stephanie (September 18, 2009). "Amtrak still rolling Hope's way". Hope Star. Hope, Arkansas: GateHouse Media, Inc. Archived from the original on July 12, 2011. Retrieved 2009-12-08. ^ "Texas Eagle And Heartland Flyer" (pdf). National Railroad Passenger Corp. 2009-10-26. Retrieved 2009-12-08. Wikimedia Commons has media related to Hope, Arkansas. 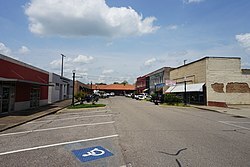 Wikivoyage has a travel guide for Hope (Arkansas). This page was last edited on 15 April 2019, at 16:36 (UTC).